Combining athletics with studying is no easy task. Only a few manage to succeed in both areas, and they are acutely aware of the high level of dedication required. In EADA’s MBA and Master classrooms, there are several athletes that have been able to balance their educational and athletic lives successfully. Let’s meet the winners of EADA’s Elite Sport Scholarship, a scholarship that supports athletes with aspirations in the business world. 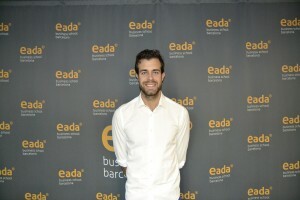 Alumni and athlete Jordi Díaz (Associate Dean of Programmes at EADA), the driving force behind the creation of scholarship, confirms that the transition from the world of sports to a business career is possible. According to Mr Díaz, athletes like those chosen for the scholarship embody two of the most valued qualities in EADA candidates, and indeed in the business world: dedication and the ability work in a team. 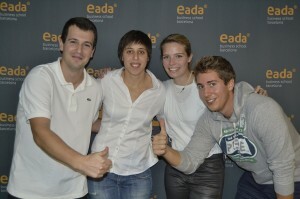 The winners of this year’s scholarship include: Ramón Betomeu, a professional fencer from Amposta, Spain; Jana Börsig, a world champion inline Alpine skater from the German national team; Ignacio Iglesias, a tennis champion from here in Catalonia; Clara Remacha, awarded the prize for best junior athlete in Catalonia; and Stephan Schmitz, a German karate expert. Below these athletes share their stories. What did it mean to you to receive a sports scholarship? R. Betomeu: After so many years of hard work and dedication, it was rewarding to receive the Elite Sport Scholarship. It’s nice to see an educational institution that values and rewards athletes for their sports careers. I. Iglesias: The scholarship represented both recognition and responsibility for me. Knowing that EADA had chosen to support me and invest in my education has made me work even harder at the Master. Why do you think it is important to support athletes in their professional business development? C. Remacha: I believe that athletes possess a set of values that can’t be learned at university or in a business school. But these values alone are not enough; professional development like that provided by EADA can develop these unique values so that they can be applied in a business organisation. J. Börsig: It is not easy to be successful in more than one area. For this reason, it is important that educational institutions support students who want to carry on as athletes during their studies. What do you think an athlete could bring to a business school programme? S. Schmitz: I believe that athletes can bring a high level of dedication to a project and teach others how to deal with extreme situations. C. Remacha: Athletes can provide a valuable long-term view; the ability to recognise where we want to go and the steps needed to get there. What similarities can you see between competitive sports and the business world? R. Bertomeu: I think they are similar in many ways. Competition and teamworking skills are fundamental for reaching objectives and establishing new strategies. J. Börsig: I think that they are very similar. Athletes are used to working under pressure, in situations that require discipline and a clear vision of the final goal. These qualities are also important for successful professionals in the business world. What was the greatest sacrifice you made when you committed to studying while continuing your career in sports? What was the best thing about this experience? I. Iglesias: My greatest sacrifice was the limited time I had for socialising. Despite that, I am very happy that I was able to dedicate so much time to tennis, a sport that I am passionate about. My greatest satisfaction came with achieving all of the goals I had set for myself, such as winning the Cup of Catalonia and completing my university studies in architecture.